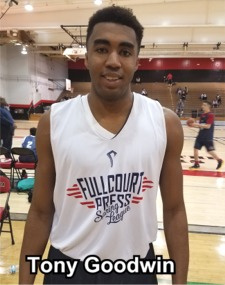 The 2017 Fullcourt Press Spring League tipped-off this past Sunday (March 5th) at Artesia High School (Lakewood CA). Opening day featured several impressive performances from unsigned seniors as well as underclassmen. Selected games were live-streamed by Baller.tvand all games were video-taped by MOSLive.com. Ronnie Flores (Ball is Life) was among the scouts in attendance checking on the talent on-hand. While we are still waiting for several of the league’s expected players to finish their HS seasons and join the league, listed below are just a few of the standouts from the league’s opening Sunday. Others will be featured in next week’s report. that allows him to be a regular visitor on the glass as well as a menacing rim-protector! Phillips still needs to fill-out and get stronger but the upside is there to be an intriguing recruit this spring and summer. Arguably as good a perimeter defender as exists on the West Coast, Goodwin is also making progress on his outside shooting which he displayed here. Very speedy swingman is also a terrific student (4.0 GPA). Dillon Brooks-style combo-forward is bouncy and has very nice scoring instincts. Rugged driver to the hoop can finish through contact. Strong lead guard with extremely confident perimeter stroke. Very good student is hearing from UC-Irvine, South Dakota State and Hampton. Strong scoring hybrid-forward can really put points on the board. New York native is also a tough defender and solid rebounder. Very versatile swingman can score in a variety of ways. Good student is getting interest from the likes of Nevada, Cal and Gonzaga. High-scoring lead guard is athletic and strong with deep range on his jump shot. Whiteside had a 30 point CIF play-off outburst recently. Sleek combo-guard has nice ability to score off the bounce and is a top-notch defender. Lefty wing is multi-dimensional player with excellent all-around skills. Potential national sleeper. Savvy guard is athletic and can score in bunches. Long post forward is active on the glass and can finish at the rim. Strong WF is quick in transition and can finish through contact. 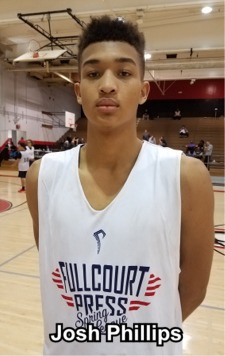 One of the West Coast’s top freshmen was invited to USA Basketball’s Mini-Camp for 2019 & 2020 players last October in Colorado Springs CO. 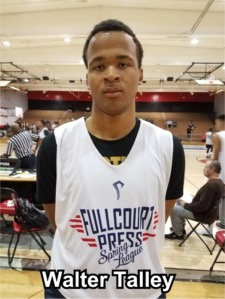 Brother of USC forward Bennie Boatwright is a late-bloomer that is a very skilled offensive scorer with plenty of range on his jump shot. Played at Village Christian (Sun Valley CA) this past season and is in process of transferring to a new school next Fall. Smooth point guard has a nice pull-up jump shot and nice command of the rock when he pushes it in transition. Son of NBA player Metta World Peace. Quick PG has nice ballhandling skills and is a pin-point passer. Good student too. 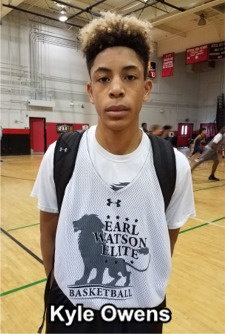 Sleeper SoCal soph has very nice length and the upside to be an effective combo-forward in the very near future. Intriguing young wing prospect has good length, feel and skills for an underclass player. One to watch. Long and very bouncy forward with terrific upside. Talented young swingman attacks the basket well off the bounce and has real ability to defend shooters on the perimeter. Athletic forward runs floor well and is a very good defender. Wing scorer can score off the bounce. Strong WG is active on the defensive end and finish in transition. Very promising young guard has nice skill set and court instincts. 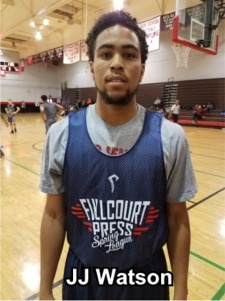 * First of four weekly reports about the 2017 Fullcourt Press Spring League.